AWS CodePipeline lets you create continuous delivery pipelines that automatically track code changes from sources such as AWS CodeCommit, Amazon S3, or GitHub. Now, you can use AWS CodePipeline as a code change-management solution for apps, Chef cookbooks, and recipes that you want to deploy with AWS OpsWorks. 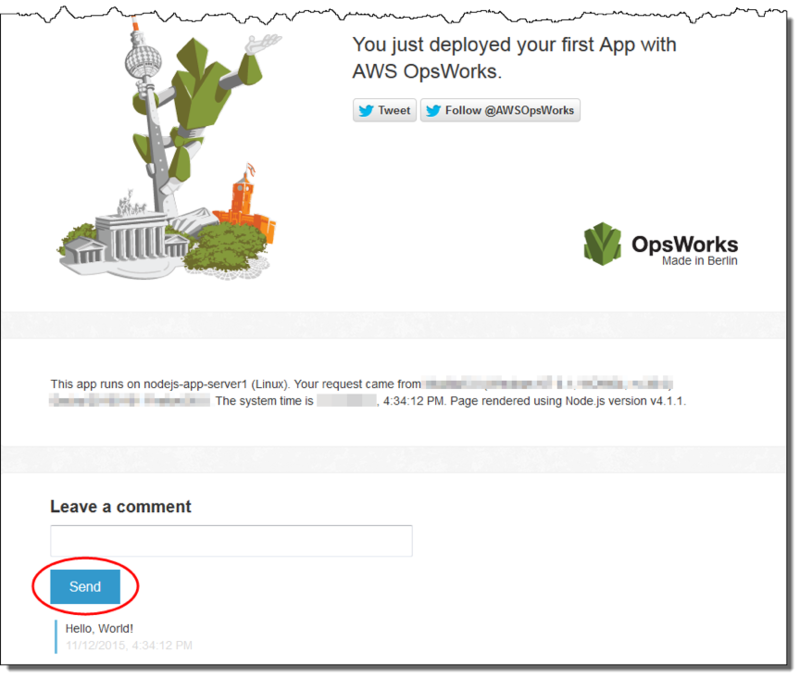 This blog post demonstrates how you can create an automated pipeline for a simple Node.js app by using AWS CodePipeline and AWS OpsWorks. After you configure your pipeline, every time you update your Node.js app, AWS CodePipeline passes the updated version to AWS OpsWorks. AWS OpsWorks then deploys the updated app to your fleet of instances, leaving you to focus on improving your application. AWS makes sure that the latest version of your app is deployed. 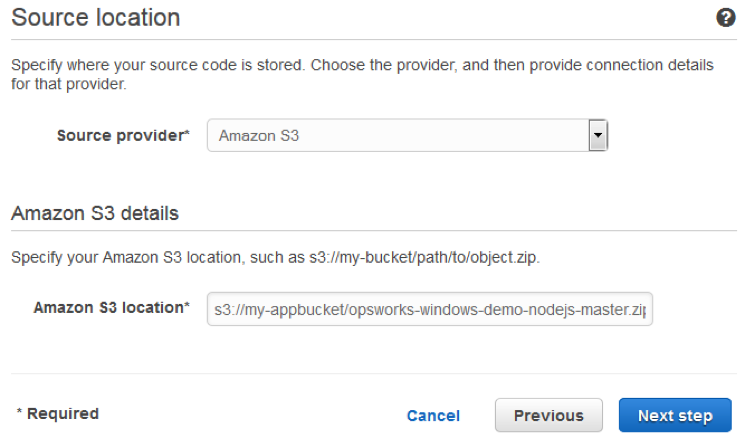 The Amazon S3 bucket must be in the same region in which you later create your pipeline in AWS CodePipeline. For now, AWS CodePipeline supports the AWS OpsWorks provider in the us-east-1 region only; all resources in this blog post should be created in the US East (N. Virginia) region. The bucket must also be versioned, because AWS CodePipeline requires a versioned source. For more information, see Using Versioning. Download a ZIP file of the AWS OpsWorks sample, Node.js app, and save it to a convenient location on your local computer: https://s3.amazonaws.com/opsworks-codepipeline-demo/opsworks-nodejs-demo-app.zip. Open the Amazon S3 console at https://console.aws.amazon.com/s3/. Choose Create Bucket. Be sure to enable versioning. Choose the bucket that you created and upload the ZIP file that you saved in step 1. In the Properties pane for the uploaded ZIP file, make a note of the S3 link to the file. You will need the bucket name and the ZIP file name portion of this link to create your pipeline. 1. Go to the Identity and Access Management (IAM) service console, and choose Roles. 2. Choose Create Role, and name it aws-opsworks-ec2-role-with-s3. 3. In the AWS Service Roles section, choose Amazon EC2, and then choose the policy called AmazonS3ReadOnlyAccess. 4. The new role should appear in the Roles dashboard. To use AWS OpsWorks as a provider for a pipeline, you must first have an AWS OpsWorks stack, a layer, and at least one instance in the layer. As a reminder, the Amazon S3 bucket to which you uploaded your app must be in the same region in which you later create your AWS OpsWorks stack and pipeline, US East (N. Virginia). 1. In the OpsWorks console, choose Add Stack, and then choose a Chef 12 stack. 2. Set the stack’s name to CodePipeline Demo and make sure the Default operating system is set to Linux. 3. Enable Use custom Chef cookbooks. 4. For Repository type, choose HTTP Archive, and then use the following cookbook repository on S3: https://s3.amazonaws.com/opsworks-codepipeline-demo/opsworks-nodejs-demo-cookbook.zip. This repository contains a set of Chef cookbooks that include Chef recipes you’ll use to install the Node.js package and its dependencies on your instance. You will use these Chef recipes to deploy the Node.js app that you prepared in step 1.1. Now that you’ve created an AWS OpsWorks stack called CodePipeline Demo, you can create an OpsWorks layer. 1. Choose Layers, and then choose Add Layer in the AWS OpsWorks stack view. 2. Name the layer Node.js App Server. For Short Name, type app1, and then choose Add Layer. 3. After you create the layer, open the layer’s Recipes tab. In the Deploy lifecycle event, type nodejs_demo. Later, you will link this to a Chef recipe that is part of the Chef cookbook you referenced when you created the stack in step 3.4. This Chef recipe runs every time a new version of your application is deployed. 4. Now, open the Security tab, choose Edit, and choose AWS-OpsWorks-WebApp from the Security groups drop-down list. You will also need to set the EC2 Instance Profile to use the service role you created in step 2.2 (aws-opsworks-ec2-role-with-s3). Now that your layer is configured, add the Node.js demo app to your AWS OpsWorks stack. When you create the pipeline, you’ll be required to reference this demo Node.js app. 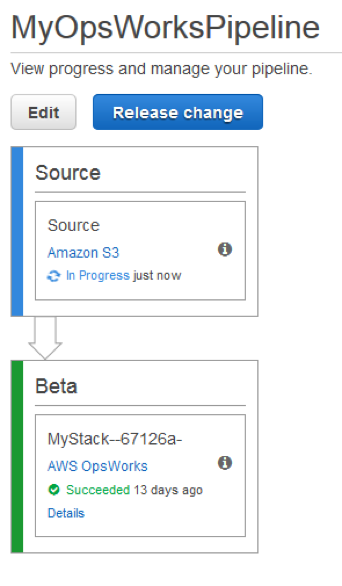 Have the Amazon S3 bucket link from the step 1.4 ready. You will need the link to the bucket in which you stored your test app. In AWS OpsWorks, open the stack you created (CodePipeline Demo), and in the navigation pane, choose Apps. Provide a name for your demo app (for example, Node.js Demo App), and set the Repository type to an S3 Archive. Paste your S3 bucket link (s3://bucket-name/file name) from step 1.4. Now that your app appears in the list on the Apps page, add an instance to your OpsWorks layer. Before you create a pipeline in AWS CodePipeline, set up at least one instance within the layer you defined in step 4. Open the stack that you created (CodePipeline Demo), and in the navigation pane, choose Instances. Choose +Instance, and accept the default settings, including the hostname, size, and subnet. Choose Add Instance. By default, the instance is in a stopped state. Choose start to start the instance. Now that you have a stack and an app configured in AWS OpsWorks, create a pipeline with AWS OpsWorks as the provider to deploy your app to your specified layer. If you update your app or your Chef deployment recipes, the pipeline runs again automatically, triggering the deployment recipe to run and deploy your updated app. This procedure creates a simple pipeline that includes only one Source and one Deploy stage. However, you can create more complex pipelines that use AWS OpsWorks as a provider. Open the AWS CodePipeline console in the U.S. East (N. Virginia) region. On the Getting started with AWS CodePipeline page, type MyOpsWorksPipeline, or a pipeline name of your choice, and then choose Next step. On the Source Location page, choose Amazon S3 from the Source provider drop-down list. In the Amazon S3 details area, type the Amazon S3 bucket path to your application, in the format s3://bucket-name/file name. Refer to the link you noted in step 1.4. Choose Next step. On the Build page, choose No Build from the drop-down list, and then choose Next step. 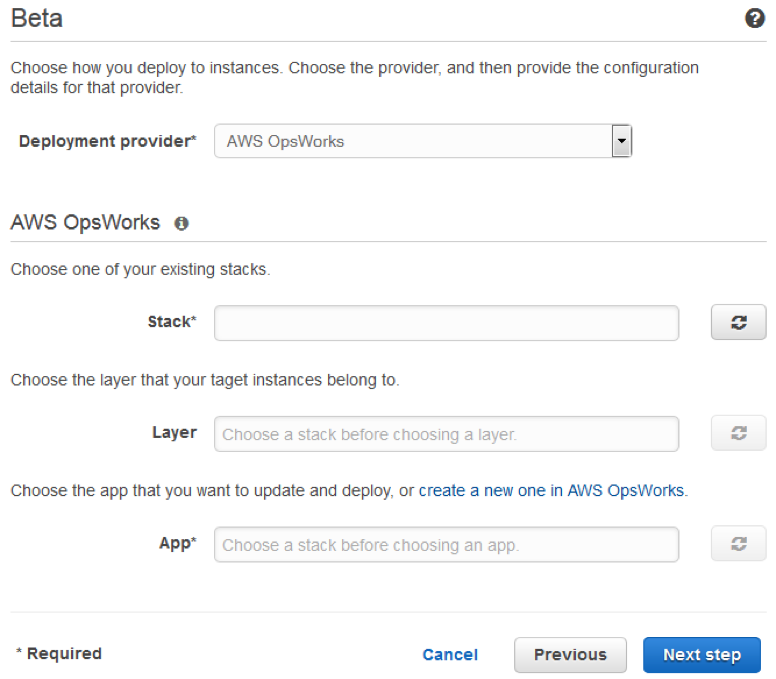 On the Deploy page, choose AWS OpsWorks as the deployment provider. Specify the names of the stack, layer, and app that you created earlier, then choose Next step. On the AWS Service Role page, choose Create Role. 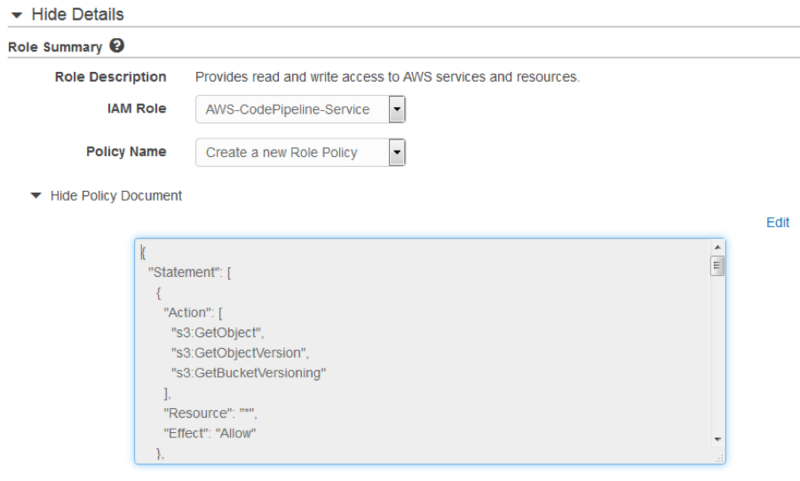 On the IAM console page that opens, you will see the role that will be created for you (AWS-CodePipeline-Service). From the Policy Name drop-down list, choose Create new policy. Be sure the policy document has the following content, and then choose Allow. For more information about the service role and its policy statement, see Attach or Edit a Policy for an IAM Service Role. On the Review your pipeline page, confirm the choices shown on the page, and then choose Create pipeline. The pipeline should now start deploying your app to your OpsWorks layer on its own. Wait for deployment to finish; you’ll know it’s finished when Succeeded is displayed in both the Source and Deploy stages. To verify that AWS CodePipeline deployed the Node.js app to your layer, sign in to the instance you created in step 4. You should be able to see and use the Node.js web app. On the AWS OpsWorks dashboard, choose the stack and the layer to which you just deployed your app. In the navigation pane, choose Instances, and then choose the public IP address of your instance to view the web app. The running app will be displayed in a new browser tab. To test the app, on the app’s web page, in the Leave a comment text box, type a comment, and then choose Send. The app adds your comment to the web page. You can add more comments to the page, if you like. You now have a working and fully automated pipeline. As soon as you make changes to your application’s code and update the S3 bucket with the new version of your app, AWS CodePipeline automatically collects the artifact and uses AWS OpsWorks to deploy it to your instance, by running the OpsWorks deployment Chef recipe that you defined on your layer. The deployment recipe starts all of the operations on your instance that are required to support a new version of your artifact.